He's a defensive end and a country singer, and Jackson Dean Nicholson's national anthem has become a highly-anticipated event. Arundel High School (Gambrills, Md.) football player Jackson Dean Nicholson’s focus on the field is always on getting to the quarterback. He is a defensive end, after all. Yet last week that football focus had to take a back seat, at least until after he stepped forward at midfield with a guitar. 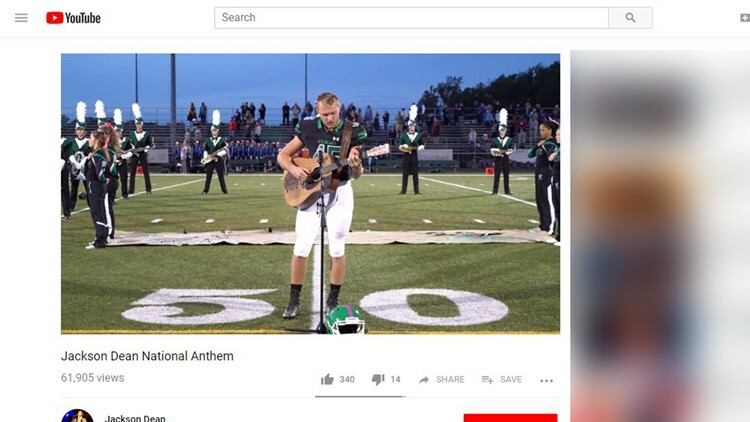 As reported by the Capital Gazette, among other outlets around the country, Nicholson stepped forward to perform a country rendition of the Star Spangled Banner before Arundel’s game against Chesapeake High School (Pasadena, Md.) last Friday. It’s the second-straight year Nicholson has performed the national anthem at one of his home games, a trend that some have begun to anticipate with excitement. The senior records and posts country music videos under the name Jackson Dean on YouTube, with his full uniform national anthem renditions developing a cult following. For a young man who says he learned to play guitar in the woods near his home which abuts a swamp and a gun range, all the attention feels a bit out of place. His performance never does. For Nicholson, the hope is that this is the beginning of his next chapter after football. He has already collaborated with noted country music producer Frank Green, and he has the support of his teammates and coaches behind him. That second part is no small feat given Arundel’s competitive goals; the Wildcats are 8-1, a likely state title contender and one of the Annapolis region’s most balanced and talented teams. Given the initial reaction to his public performances on a football field, this may just be the first, not last time that the American public falls in love with Jackson Dean’s musical talent. “This is my last year, then I’m done. I’ve got until January, I’ll have all my credits done, and I only have to be enrolled for this semester,” he said. “I got a waive by my principal and she’s very supportive of what I do.